I originally trained as a Special Needs teacher and it was through this very rewarding work helping others reach their true potential that I was drawn into the counselling profession. Since qualifying in 2000 I have worked with various agencies both in the private and voluntary sector as well as running my own private practice in Farnham, Surrey. I see people from all walks of life with many diverse and varied issues causing them concern, helping them to find clarity and resolution. The therapy model I work with is Integrative which means that I am able to work with more than one approach, enabling me to find the one most helpful to my clients. 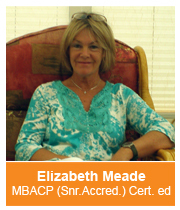 I hold an advanced Diploma in Humanistic and Integrative Counselling and a certificate in Marital Counselling. I am a senior accredited member of the British Association for Counselling and Psychotherapy (BACP) and I am registered with the United Kingdom Register of Counsellors (UKRC). Membership of these bodies means that I am bound by a strict code of ethics and professional conduct (www.bacp.co.uk) and undertake ongoing supervision and continuing professional development. NLP (Neuro - Linguistic Programming) and Solution Focused Therapy.